States and districts should use multiple indicators for school accountability that drive a more holistic view of student success. Accountability is more than school ratings. States have an opportunity under ESSA to expand their vision. School climate, social and emotional learning, and resource equity measures can inform comprehensive accountability. States should use some measures to classify schools, some to guide local interventions, and all to support students. The Every Student Succeeds Act gives states the opportunity to broaden their vision of accountability and create school classification systems using new measures of school quality or student success. School accountability in the United States is evolving—and for good reason. Rather than merely labelling failure, accountability should provide information on school progress and inspire a culture of continuous improvement. To accomplish this goal, the concept of accountability must become much broader so that it encompasses a system of data collection and reporting, classification of school performance, direction of supports and implementation of interventions, and assessment of resource allocation. The Every Student Succeeds Act, or ESSA, is a key lever for this broader vision. The new law requires states and districts to create comprehensive data dashboards; states to design systems that identify schools for improvement using new measures of school quality or student success; and districts to develop improvement plans based on school-level needs assessments. To support this broader vision, states and districts should also use their systems to direct resources to schools that are not identified for improvement but need additional supports. This approach is an important shift from previous iterations of federal law, which often focused on a single test on a single day. The Improving America’s Schools Act—the 1994 reauthorization of the Elementary and Secondary Education Act, or ESEA—cemented accountability as a strictly academic notion.4 The No Child Left Behind Act, or NCLB—the 2001 reauthorization of ESEA—strengthened this premise and required districts and schools that failed to make academic progress to take specific improvement actions.5 NCLB also required states to hold schools accountable for an academic indicator other than student achievement in reading and math. However, states viewed this as simply another way to potentially miss their yearly targets instead of an opportunity for improvement. As a result, states largely limited measures to graduation rates for high schools and, most commonly, attendance for elementary and middle schools. 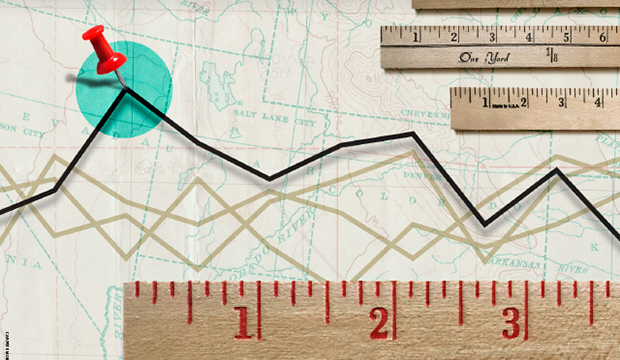 Some states also began to measure student growth in academic achievement. As the latest reauthorization of ESEA, ESSA builds on this progress by carving out space for new measures of success while maintaining an emphasis on academic outcomes. In doing so, the law recognizes that test scores do not tell the whole story and shines a spotlight on additional indicators of student performance. Many states already use an indicator of college and career readiness at the high school level, and these measures are good candidates for indicators under ESSA. This report explores some newer, less commonly used indicators, including measures of social and emotional learning; school climate and culture; and resource equity, which have recently caught the attention of state policymakers. A group of districts, however, offers insight for states considering some of these new indicators. The California Office to Reform Education, or CORE, districts created a school classification index that includes both social and emotional learning and school climate and culture indicators. This report examines lessons learned from this work. As states consider these new indicators, they must keep in mind that school classification systems are only one part of a broader vision of accountability. To support continuous improvement, accountability systems should also include indicators that are appropriate to examine at the district or state level, such as measures of resource equity. This report highlights measures of student access to highly effective teachers, access to early learning opportunities, school funding, high-quality curriculum, a well-rounded education, and student health and wellness. 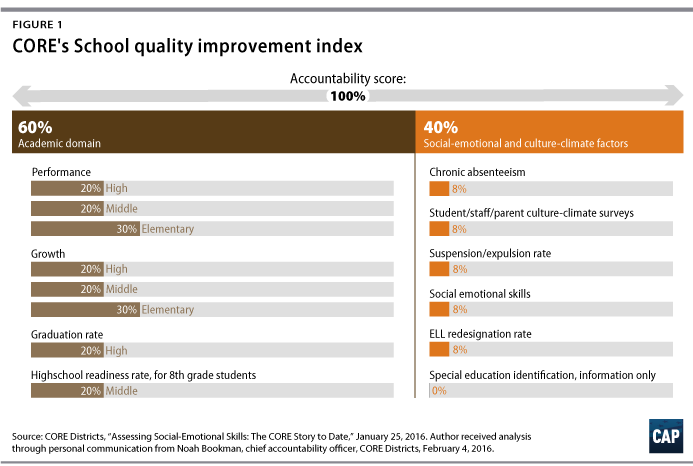 States and districts should use a variety of indicators under a broader system of accountability. States must first set their vision or goal for accountability and choose indicators that guide the direction of supports, implementation of interventions, and allocation of resources to help all schools reach this goal. Measures that may be leading indicators for early warning systems, such as school climate and culture, and measures of social and emotional learning can provide important information to schools and educators to improve classroom teaching and learning. When considering which indicators to use at the state level to classify schools, states should use valid and reliable indicators, such as rates of chronic absenteeism and measures of college and career readiness, but be cautious about using new indicators. Policymakers need more research to determine if indicators of social and emotional learning are valid, reliable, and not corruptible in a high-stakes environment. School climate and culture surveys, on the other hand, have been validated by research. However, states should exert some caution as they consider these data for high-stakes settings. Districts should be key drivers within comprehensive accountability systems by supporting continuous improvement; tracking additional measures of school quality and student success; using these measures to inform local decisions about resources and supports; and serving as laboratories of innovation for the state. These efforts can inform improvement plans for low-performing schools and highlight needed areas of support in other schools that would benefit from additional resources. District innovation may also be particularly useful to develop measures of social and emotional learning, as exemplified by CORE’s approach. States should measure and report on school quality and student success indicators that are actionable for districts—not just schools. In particular, measures of resource equity have a significant effect on student achievement, but decisions about resource allocation are often made at the district level. To inform interventions using these data, states have several options. For example, states can create or improve district accountability or classification systems. They can encourage or require districts and schools to report these measures, alongside school accountability data, in data dashboards systems that provide a wide array of information about individual indicators. They can also give school improvement funding priority to districts taking particular action based on key data. States should take the opportunity provided under ESSA to design comprehensive systems of accountability that use multiple indicators to support continuous improvement. Under this broader vision, states should use some indicators to classify schools; others to inform local decisions about resources and supports; and all measures to ultimately support classroom teaching and learning, school quality, and student success. Students’ intelligence alone does not determine their academic success. Other skills matter greatly, and which skills particularly contribute to performance has increasingly become the focus of education research. Attributes referred to by a plethora of terms—including but not limited to noncognitive skills, soft skills, 21st century skills, and personal qualities—can have substantial effects on student achievement.13 This report use the term social and emotional learning, or SEL, to refer to these traits. States should be cautious about using measures of social and emotional learning to classify schools because of measurement limitations. Additional challenges include the inconsistency of students’ attitudes and beliefs over time and their limited ability to perceive their own skills. Many student-level measures of social and emotional skills, for example, naturally trend downward at certain ages, regardless of whether or not students’ skills have actually declined.48 Research has also found that students are more candid when talking about, or rating, their peers than they are themselves.49 As a result, more research is needed to determine if and how states should use these measures to identify schools for improvement. There is also some state-level opposition to assessing students’ social and emotional skills. In 2015, for example, Louisiana passed a law prohibiting state-adopted standards and assessments from including content or questions that measure noncognitive or emotional characteristics.50 Nonetheless, information on students’ social and emotional learning data may still be important for states to include in a more comprehensive system of accountability. For example, the student questionnaire on the National Assessment of Educational Progress, or NAEP, will gather information on students’ social-emotional skills in 2017.51 Researchers intend to use these data to analyze the relationship between SEL and academic achievement on the NAEP exam.52 Districts and schools may find this information particularly useful to inform local interventions and improve student performance and behavior. For example, a school could overhaul its library to lay the groundwork for a cultural shift. With access to better resources, students’ perceptions of their learning environment may improve. These attitudes, along with an improved sense of care, may ultimately affect the school’s culture. Similarly, a school could develop a student-teacher mentorship program to improve interpersonal relationships and ultimately foster a greater sense of culture and community. Recent research underscores this point. A 2016 report highlighted the evidence linking social and emotional skills, such as self-control, to school quality.71 Furthermore, a 2015 study found that students with parents who were highly satisfied with the school environment, including the school’s disciplinary practices, had higher levels of perseverance and better attitudes toward school.72 As a result, research-validated culture-climate survey tools may serve as a proxy for students’ social and emotional skills. How much do you agree with the following statements about students in your school? Stop and think before doing anything when they get angry. Give up when they cannot solve a problem easily. Get into arguments when they disagree with people. Do their best, even when their schoolwork is difficult. Think it is OK to cheat if other students are cheating. Source: National Clearinghouse on Supportive School Discipline, “AIR Conditions for Learning Surveys,” available at http://supportiveschooldiscipline.org/resources/air-conditions-learning-surveys (last accessed November 2016). States should consider using survey measures of school culture and climate data in their broader systems of accountability by collecting, reporting, and using the data to inform resource allocation and supports, particularly at the local level. They should be cautious when deciding whether to use them in a high-stakes way to identify low-performing schools. 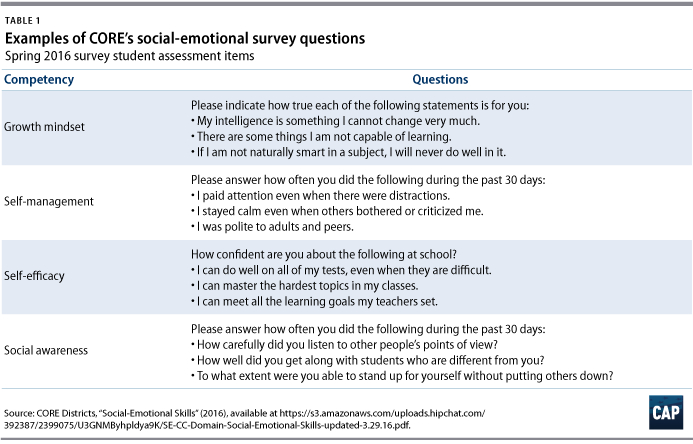 Experts have argued that climate instruments are more advanced and accurate than those designed to measure social and emotional learning.83 As noted earlier, student responses to questions about their experiences or themselves may be more accurate than student perceptions of their own skills. Additional options for measuring school culture and climate include early warning indicators such as chronic absenteeism. A chronically absent student misses at least 10 percent of the school days in an academic year. This can have a significant effect on achievement and is a strong predictor of high school completion. For example, chronically absent kindergarten students struggle academically in first grade. By sixth grade, chronic absence predicts the likelihood of a student dropping out of high school.84 In the 2013-14 school year, 14 percent of students in the United States—or 1 in 7 students—were chronically absent, having missed at least 15 days of school.85 Chronic absences were particularly prevalent among students from low-income families, students of color, and students with disabilities.86 As a result, consistently missing school compounds the challenges that disadvantaged students already face. Across the country, racial and income-based disparities in access to quality school resources amplify achievement and opportunity gaps.96 This section explores resource-related measures that contribute to student success both within and outside of a school’s walls, including access to highly effective teachers, high-quality early learning opportunities, adequate school funding, high-quality curriculum, a well-rounded education, and student health and wellness. Although these measures are important indicators of school quality and student success, they are often not under a school’s control. Rather, districts and states play a significant role in ensuring that schools have the capacity to provide equitable access for students. As a result, states should include indicators of resource equity in their broader systems of accountability and exclude from school classification systems measures over which schools do not have control. For example, states should include in a data dashboard school and student-level measures that quantify access to resources, programs, and funding, in addition to measures of health and wellness that affect student performance. States should also identify additional indicators that would best support continuous improvement and local interventions. ESSA defines a well-rounded education as one that includes subjects such as arts, music, and physical education.118 Improving access to these enriching experiences yields promising results, particularly for students from low-income families. Measures of resource equity correlate with key student outcomes. Student access to resources that shape their classroom experience—from funding to instructional supports—has a significant effect on everything from achievement and persistence to future earnings. However, these measures are often outside of a school’s control. Accordingly, states should consider these indicators for their broader systems of accountability, such as in rich data dashboards, to inform continuous improvement. ESSA supports a broader vision of accountability to support continuous improvement. The new law also gives states the opportunity to use more holistic measures of school quality and student success to classify schools. As states develop their new systems, they will need to determine if new indicators of interest will be meaningful contributions. Understanding the readiness and appropriateness of data will help states in this effort, signaling which measures they should use to classify schools at the start of implementation; which they should add over time; and which are better suited to inform interventions and supports. Accordingly, states should also use multiple indicators as part of their broader system of accountability but be cautious about using too many to classify schools. Otherwise, states run the risk of diluting measures and overcomplicating their systems. To accomplish these goals, CAP recommends the following steps. Before states design their school classification systems, they must first set their vision or goal for accountability. The indicators included in their systems must then guide the direction of supports, implementation of interventions, and allocation of resources to help schools reach this goal. As states begin this process, they must keep in mind that accountability is a full system of data collection and reporting, classification of school performance, direction of supports and implementation of interventions, and assessment of resource allocation. The measures that states collect should do more than help them identify the lowest-performing schools—they should help states identify areas of need in all schools as well as assist districts and schools in making informed decisions about resources and supports. In order to support schools in this process, states and districts should collect and report data on a variety of indicators, such as measures that may be leading indicators for early warning systems. Measures of school climate and culture, for example, correlate with student achievement, success, and persistence. Accordingly, states should measure data about school safety; relationships between students, teachers, and peers; classroom cooperation and collaboration; and school environment and engagement to drive interventions in support of the state’s vision. States should also consider measuring social and emotional learning, which can provide important information to schools and teachers to improve classroom learning. As states consider which measures of school quality or student success to use to identify schools under ESSA, they must keep in mind that some indicators are better suited for use in the broader accountability system—measuring, reporting, and using the data at the local level—rather than use at the state level to classify schools. Indicators that states include in their school classification systems should incentivize school and district actions, correlate with key student outcomes, and meaningfully differentiate school performance. However, even if an indicator does not meet all of these characteristics, a state may still have compelling reasons to use it to classify schools if it is a valid and reliable measure. For example, an indicator that does not significantly differentiate school performance may have a strong relationship with important student outcomes. As a result, this measure may encourage action at the local level. Furthermore, indicators may represent particular state values and send a worthwhile signal to districts and schools. To maximize value, indicators should share at least two of the three characteristics described above. Similarly, many states are already collecting valid and reliable measures of college and career readiness that incentivize schools to increase access to advanced coursework or certifications, among other important opportunities. Although outside the scope of this report, states should consider which indicators would provide a comprehensive picture of college and career readiness in their communities. For example, some states may determine that in addition to postsecondary enrollment, military enlistment is an important indicator for their school classification systems. States should then introduce newer measures for use in school classifications once they have collected data that are valid, reliable, and not subject to manipulation in a high-stakes environment. Some measures require more time in development, and states should not use data the first year it is collected. Furthermore, not all indicators can or should be used to classify schools; some may be better suited to inform local interventions or for public reporting. States must be particularly mindful of these criteria as they consider new types of indicators, such as school climate surveys. Some states are already using climate surveys to classify schools, some are beginning to administer and collect survey data, and others are considering surveys. States with past survey experience should continue to monitor the data’s performance in the presence of high-stakes decisions. States that are collecting survey data for the first time should initially use this information for reporting, needs assessments, and intervention planning. They should only use this information to classify schools once they are confident that the data is valid and reliable. To improve the identification of school-level needs and the allocation of supports, districts should develop, measure, report, and use additional measures of school quality and student success that the state may not use for school classifications. These measures can inform improvement plans for low-performing schools and highlight areas of support for schools that the state does not identify for improvement under ESSA but that would also benefit from additional resources. 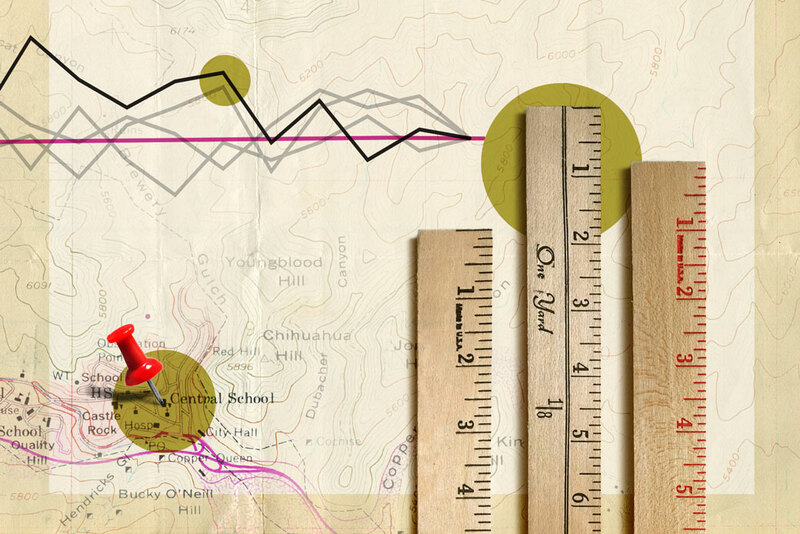 In addition to their role in comprehensive accountability, districts can innovate locally to inform statewide school classification systems by developing and testing measures in the absence of high-stakes. This process can determine whether states should scale up measures for school classifications or whether states and districts should use them at the local-level to inform continuous improvement. For example, implementation at the district level may determine that an indicator of interest is valid and reliable but does not differentiate well between schools. A state may still choose to use this measure to classify schools because it incentivizes particular school activities. Alternatively, the state or district may opt to report this indicator in a data dashboard rather than using it to classify schools. This latter approach may be appealing for indicators that are particularly actionable for schools but for which researchers lack confidence in validity. This authority would give CORE the opportunity to identify schools for intervention and support using measures of student performance, such as measures of social and emotional learning and an innovative indicator of high school readiness, that are not included in the state’s proposed school classification system. The CORE districts—and the state—would then be able compare the schools that each system identifies to understand which indicators better captured the lowest-performing schools. However, both the CORE districts and other districts can continue to innovate locally without state authority by developing, testing, and reporting measures that the state does not use for school classifications. District policies and procedures greatly influence the ability of a school to accomplish its goals.140 As a result, measures of school quality and student success that are outside the locus of a school’s control may be useful to hold districts accountable for student outcomes and to support school improvement. In particular, measures of resource equity have a significant effect on student achievement but are less actionable for schools directly. Accordingly, states should report these measures in data dashboard systems so that information is transparent and easily accessible for district use. Next, states should use these data to inform local strategies. For example, states can create or improve district classification systems. In 2012, Tennessee began classifying districts based on academic achievement, gaps, and growth.142 The state could build on this system with additional measures that are actionable at the district level and have a significant effect on school and student performance. States can also encourage or require districts and schools to report measures of resource equity in data dashboards systems alongside school classification data. Increased transparency and accessibility is a necessary step to make improvements based on these indicators. In addition, states could give school improvement funding priority to districts that plan to take particular action based on these data. States have the opportunity to create a broader vision of accountability that encompasses a system of data collection and reporting, classification of school performance, the direction of supports and implementation of interventions, and assessment of resource allocation. To support this comprehensive vision, states and districts should use multiple indicators that drive a more holistic view of student success with a focus on continuous improvement. As states select indicators for their school classification systems, which are just one part a comprehensive accountability system, they should include measures that are valid, reliable, and drive behavior at the local level, such as rates of chronic absenteeism and measures of college and career readiness. Districts can support this work by measuring and reporting additional measures of school quality or student success and serving as laboratories of innovation for the state. States should also measure a variety of indicators, including those outside of a school’s control, such as measures of resource equity, to better support improvement. ESSA can help shift thinking in this direction, as it requires states to create both summative school classifications and data dashboards. The new law also gives states the flexibility to improve their systems over time, which should encourage states to expand data collection, reporting, and use. Samantha Batel is a Policy Analyst with the K-12 Education team at the Center. Her work focuses on school standards, school and district accountability, and school improvement. Prior to joining CAP, Batel was a confidential assistant at the U.S. Department of Education in the Office of Elementary and Secondary Education and a fellow at the American Constitution Society for Law and Policy. She graduated with a bachelor’s degree from the Woodrow Wilson School of Public and International Affairs at Princeton University. Scott Sargrad is the Managing Director for Education Policy at the Center. Prior to joining CAP, Sargrad served as the deputy assistant secretary for policy and strategic initiatives in the Office of Elementary and Secondary Education at the U.S. Department of Education, where he had the primary responsibility for key K-12 education programs and initiatives, including the Title I program, Elementary and Secondary Education Act flexibility, and School Improvement Grants. He joined the department in 2009 as a presidential management fellow in the National Institute on Disability and Rehabilitation Research and also worked as a senior policy advisor in the Office of Planning, Evaluation and Policy Development. Laura Jimenez is the Director of Standards and Accountability at the Center. Previously, Jimenez served as the director of the College and Career Readiness and Success, or CCRS, Center at the American Institutes for Research, or AIR, which supports states in implementing their CCRS priorities. Prior to her role at AIR, Jimenez served as a special assistant in the Office of Elementary and Secondary Education at the U.S. Department of Education, where she advised on policy for key K-12 education programs and initiatives, including the Title I program; Elementary and Secondary Education Act flexibility; School Improvement Grants; and programs that serve American Indian, Alaska Native, and homeless children. Jimenez has also overseen large scale college access programs funded by the National Institutes for Health and the Bill and Melinda Gates Foundation. She also served as a teacher in the U.S. Peace Corps. Jimenez received her bachelor’s degree from the University of California, Los Angeles and holds a master’s degree in social welfare from the University of California, Berkeley.